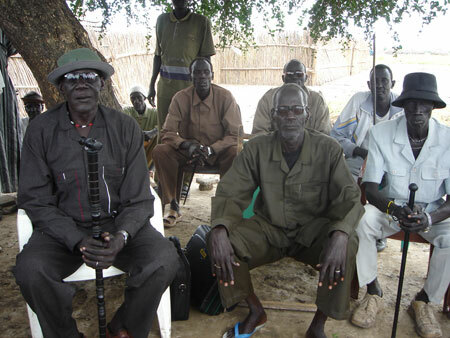 A group portrait of Nuer men at Nhialdiu, including the Paramount Chief of the Nuer Leek, Tungawer (left). Other chiefs sit around him, as well as the administrator of Nhialdiu in the centre. Morton, Chris. "Chief of Nuer Leek" Southern Sudan Project (in development). 03 Jan. 2006. Pitt Rivers Museum. <http://southernsudan.prm.ox.ac.uk/details/2007.137.96/>.